Destination tourism often has a larger story to tell beyond just one institution, even one as iconic as the Baseball Hall of Fame in Cooperstown, NY. Even if you don’t pay close attention to baseball, you know it as “America’s National Pastime.” Part of the joy of this industry is finding the story to tell that brings people to a region and to your specific tourism destination. Cooperstown has a bit of everything: a perfect small-town vibe, birthplace of author James Fenimore Cooper, and fall foliage and outdoor fun to rival anywhere else. Like Cooperstown, every destination has a unique story to tell. On this episode of Destination on the Left, I speak with Craig Muder. We talk about his work with the Baseball Hall of Fame, and how destination travel can be a real anchor business for a small town. Craig joined the National Baseball Hall of Fame and Museum in 2008 as the Director of Communications. His responsibilities include managing the Hall of Fame’s publication projects, editorial calendars, and content distribution, along with media relations. A native of Hubbard, Ohio, located about half-way between Cleveland and Pittsburgh, Craig graduated from Kent State University in 1991 and embarked on a 17-year career in newspapers as a sports writer and editor. A lifelong baseball fan, Craig covered Hall of Fame induction ceremonies and other museum events from 1998 through early 2008 at the Utica Observer-Dispatch before finding a home at the Hall of Fame. Craig and his wife and two daughters live in New Hartford, New York. I’m so excited that you’ve joined me today, Craig. Thank you for spending some time with us. Thanks for having me on, Nicole. This is great. I’m very excited to hear all about the Baseball Hall of Fame. First, you just had one of the largest events ever for the Hall of Fame induction weekend, so I’ll be looking forward to hearing all about that. Before we get started, could you tell us a little bit more about your story in your own words? Sure. When I was 12 years old, I realized I was not going to hit or field the ball like Mike Trout, that I did not have that skill set. If I was going to stay around baseball, which I dearly loved, there was going to have to be another way. I originally started with the idea of becoming a broadcaster, but very quickly discovered that I loved writing. It was something I had an aptitude for, and so went down that path and worked for newspapers for 17 years covering baseball and other sports. Then, in 2008 I had been in Utica, New York, which is about dead center of the state and about 45 minutes from Cooperstown. I’d been in Utica for about 10 years and got to know the folks at the Baseball Hall of Fame, but never really thought there was any possibility to work here. It was a dream beyond dreaming. One day the guy who would become my boss called me up and said, “Would you like talk about this job?” I said, “Yeah. Would I like a guided tour of heaven? Sign me up, I’m ready.” It’s been a wonderful 10-plus years here in this Cooperstown dream job. That’s awesome. Absolutely. Especially for that 12-year-old who was looking for a route to be involved in baseball. Right? He still lives in me, absolutely. Every day when I walk into the museum, I get that feeling. That’s awesome. Well, I’ll tell you, I didn’t play baseball as a kid, but I’ve walked into that museum. Whether you’re that 12-year-old that was in love with baseball the way you were or just in love with the whole Americana, you walk in that museum and you get that feeling of history and that whole Americana experience. I can totally relate to that. Baseball is really tied to America like no other sport and really few other institutions. That’s what the Hall of Fame is all about, telling that story and how they intersect. It does a fantastic job doing that. There are so many choices for visitors to spend their time and money. The Baseball Hall of Fame is a very unique attraction in and of itself. I’m wondering what you have done in your role there to help the museum stand out from the crowd and cut through all that clutter that’s out there. People have so many choices these days. We’re really fortunate because baseball is such a part of society and it’s so prevalent throughout media that we get a lot of promotion through that. It’s almost organic. We tell people, “The next time you watch a baseball game, listen carefully and see how long it takes the announcer to use the phrase ‘Hall of Fame’ or ‘Hall of Famer.’” Probably by the third inner they will. That’s what really helps drive us because there’s this connection to the game. The game itself is so steeped in history and reveres history so much, and the Hall of Fame is where that is preserved. The pulse of the game beats the strongest when you come to Cooperstown. Now, that being said, we are very active on social media, and that presence has increased over the last five years or so as many museums have done in order to get more visible throughout the country, and certainly that’s part of what we’re doing to make sure that everybody has access to Cooperstown. We’re in central New York, so maybe if you can’t come to the Hall of Fame, you can still experience it through our website, which is baseballhall.org, or through our new pastime database where we are in the process of digitizing all 40,000-plus artifacts we have, all three million library documents, all 250,000 photographs. We’re digitizing all those into our pastime account so that everybody can experience the history that we have here in Cooperstown. Wow, that’s amazing. That’s quite a huge project to undertake. Can you talk a little bit more about how that came about and how you’re actually accomplishing that? Absolutely. This began in 2014 when we started to look at a digital asset management system that could handle all of our assets. We established this through some partners. We were able to build this, and now it’s a matter of scanning everything in, which is going to take some time. Think about 40,000 three dimensional artifacts. Then we have about a quarter of a million photographs and three million documents in our library. It’s going to take some time to do it, but the purpose of it is to make sure that everybody can share these things. The Hall of Fame is a non-profit history museum. We work very closely with MLB, but we are not owned or operated by Major League Baseball. Our goal as a history museum is to make sure we tell the story of this game that’s been so important to this country now for literally almost 200 years. I’m curious. Was there any pushback or any concern about replacing the actual physical visitation to the museum by going in this direction? Did you think about how this might affect that, or does this really more compliment the physical visitation experience? We like to think it compliments it. Our visitation is pretty steady at 300,000 visitors per year, which is incredible when you think about the size of Cooperstown. 1,800 year-round residents live in this village. It’s a one stop light town literally. Yet, we have 300,000 visitors come through our doors every single year. It’s something we’re trying to make sure that everybody has access to, not just in this country but around the world, to the history and the game that is baseball. That’s fantastic. 1,800 year-round residents. Wow. I didn’t realize. We had a museum series on this podcast earlier this year where had gone to the Museum Association of New York Conference and spoke with a lot of museum folks. One of the things we were talking about is the museum as a community anchor and how what they do to support the community in that way. I have to say you must be a huge community anchor for Cooperstown. Can you talk a little bit about how you integrate the community in that way? It certainly is, but it is certainly not the only anchor that Cooperstown has. For a village of this size, it is absolutely remarkable, the cultural and other opportunities that are available in Cooperstown. We have a world class hospital, Bassett, which is a teaching hospital for Columbia University. We have two other excellent museums, the Fenimore Art Museum which features a lot of Native American art, and the Farmers Museum which is a working farm that documents the history of farming in this country. When you look at all that and all the history that’s here, it really is incredible that a village of this size supports that. It does take a community to support those institutions, and it really is intertwined with how the town exists on a daily basis. Cooperstown is a very historic place. James Fenimore Cooper lived here and wrote here and published The Last of the Mohicans , which is clearly the first great novel in American history. This is a town that is not just about baseball, although we are very proud that the Hall of Fame is here. That’s terrific. I want to switch gears just a little bit, Craig. We like to talk a little bit about challenges and the creativity that comes from facing some sort of a challenge. I’m wondering if there is a challenge that your museum has faced and maybe a creative solution that could share with us that came from that. I think that one of the things we look at, Nicole, is what we call shoulder season between peak and off-peak. We do about two-thirds of our attendance between June 1st and August 31st every year. We look for ways to attract visitors here during May, or during September and October in fall. Cooperstown, as you’re well aware, is absolutely spectacular in terms of what Mother Nature provides. We look at ways to do attract people with that. We do that programming, different things like the World Series Gala, which is an event where folks come to the museum and watch one of the games of the World Series on the theater. That’s what we try to really look at special programs. Also, we have VIP tours that happen during those shoulder seasons, because it is a spectacular time to visit the museum. Cooperstown in winter gets a little cold. We’re not going to kid you. In New York State we get our fair share of snow, that’s for sure. When you look at eight, nine months out of the year, Cooperstown is a naturally wonderful place to visit. We’re constantly looking for ways to attract folks here. Shoulder season for sure for New York destinations, and I’m sure actually in destinations in other parts of the country as well. Everyone has their peak seasons and then their slow seasons, and trying to come up with the incentives and programming to attract folks on that shoulder is so important. Looking into the future, is there a project that you’re really excited about that you’d like to share with us? Well, certainly one thing we just completed was our Grandstand Theater renovation. This has been completed in the last few months. The Grandstand Theater is really the first step a visitor gets when you come into the museum. You see a film about 12 minutes long about the history of the game and why it’s so important. We just renovated this. It is now an absolute state-of-the-art theater where we could hold concerts on our stage now. It’s absolutely incredible with the lighting and the sound. We also re-launched the film. The film is now called Generations of the Game. 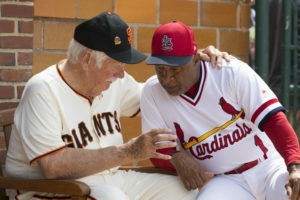 You watch players like Cal Ripken Jr. and Joe Morgan talking about what baseball means to them. You see them crying, literally, they’re on the film crying because what baseball has done for them. You know then why you visited the Hall of Fame and what it’s all about. We’re very, very proud of the new Grandstand Theater that just opened up. Then, going forward, our next exhibit is going to be on baseball cards. That’s going to open in 2019. A lot of times, people’s love of baseball started through baseball cards, especially looking from the 1980s and back. That’s going to be an absolutely wonderful exhibit. We’re looking forward to that. We open about an exhibit every other year on the average. My husband’s got a stack of baseball cards at home in a shoebox. I can see him coming out and seeing what he doesn’t have, or what he wishes he had. That’s great. Switching gears again just to talk a little bit about collaboration. It’s a topic I love to talk about because I find in this industry there’s just so much collaboration that happens. I like to call it “co-opetition”, where perceived competitors might come together and collaborate on a program to do something bigger than what they could do on their own. I’m wondering if there’s a time when a collaboration such as that worked for you. The Hall of Fame is a unique place. We have partnered with places like Eastman Museum for certain online exhibits that we’ve done in the past. Certainly, that is an opportunity that we look for. The Hall of Fame is so unique because it’s really three institutions under one roof. It’s the Hall of Fame, celebrating the 323 Hall of Famers, and then it’s the museum, which is the entire history of baseball, and then the third element is the library. We are really unique in terms of how our museum works because of the Hall of Fame component. Upstate New York State has so many museums and cultural institutions. We are able to partner with them like we did with the Eastman Museum on a regular basis. That’s terrific. Can you talk a little bit about how you work with your tourism office? Many of our listeners are either in a position similar to yours where they might be working with a tourism office, or they are on the tourism promotion side listening to this podcast. Can you talk a little bit about that relationship and how that works for you? I Love New York has been a wonderful partner with us and has helped with projects ranging from audio and video ads to literally in-museum publications. It has been a great relationship, and it has gotten more and more robust over the last five to 10 years or so. We’re very fortunate to have a good partner with them. The New York State tourism push is very strong right now. The state recognizes that this a major part of the economy, and so we’re very fortunate. I would absolutely agree. I Love New York is doing a tremendous job. The pace has picked up quite a bit in the past five to 10 years, and that’s really awesome. Let’s talk about the induction weekend and what that means to the museum because I know it’s a huge event for you. How does that fit into the whole mix of what you do and the visitors that you attract? Can you talk a little bit more about that? It’s certainly our biggest weekend of the year. We’re aiming at it pretty much as soon as we get the new class, which will happen in December and January of any given year. Then, we’re looking forward to not only exhibits, we’re introducing exhibits for the new inductees. We bring the new inductees to town in the spring to get what’s called an orientation tour where they about us, and understand what the weekend is going to be all about. For the Hall of Famers themselves or the new Hall of Famers, induction weekend is kind of like a family wedding. It’s a once in a lifetime thing. You have all your family and friends here to experience it with you. The logistics are pretty massive, and we have folks who walk through with the inductees so they understand what’s going on, and we make it as comfortable for them as we can. From a fan standpoint, our biggest day of the year for attendance is usually the Saturday before induction. Nearly 9,000 fans went through the museum on Saturday, July 28th this year, which is our fifth biggest crowd ever I believe for any one single day. Those are massive days, massive times for us. 53,000 fans total were at the induction ceremony. The ceremony is held about a mile south of the Hall of Fame at The Clark Sports Center here in Cooperstown, which is a natural amphitheater. When you think about that, 53,000 people in a town of 1,800 people year round, the logistics of that are pretty awesome. We’ll work on that all throughout the year to make sure everybody is as comfortable as possible and understands what the do’s and don’ts are as you’re experiencing this. We’re looking at having bigger crowds even than that in a couple years because some real Yankee legends come on the ballot here. 2019, Mariano Rivera is eligible for the first time, and then 2020, Derek Jeter is eligible for the first time. For our induction weekend, if we have inductees who are on the east coast who played for New York, played for Baltimore, played for Philadelphia or Boston, those cities, our crowds tend to be a bit bigger because they can do a day trip. People can drive in and out of Cooperstown. We know that these are going to be some big ones. Our all-time biggest crowd was 82,000 in 2007 for Cal Ripken Jr. and Tony Gwynn. We suspect in the next couple years, we’re going to approach or even pass that. Wow. That’s amazing. I can imagine the logistics behind that and how you probably have to start planning for the following year as soon as this year’s induction weekend was over. Right? We do. In fact, I just finished talking with some people about next year’s induction and some of the logistics that we’re going to look at, some things that we can improve on from what we did this year. Yeah, it really is something that is virtually year round. That’s amazing. Well, Craig, this has been a terrific conversation as I knew it would be. I’m wondering before we say good-bye, if you have any final words of wisdom, or any other ideas that you’d like to share with our listeners. For travelers, Nicole, I always tell folks if you’re coming to the Hall of Fame for the first time or even the tenth time, and you’re looking for the best time to come, Columbus Day weekend is great because the leaves are spectacular. The museum crowds are a bit lighter than they are during the summer. It really is a special place not only for baseball fans but for fans of Americana. You’re walking down a Main Street that’s right out of Norman Rockwell. You’re going to see Cooperstown at its absolute best. You feel that, that sense. You look in storefronts as they looked like in towns all across the country in the 1950s but now are virtually gone. It still exists here in Cooperstown, and along with the Hall of Fame obviously, we have the natural beauty of the village. We’re located at the foot of Otsego Lake, which is a nine-mile long lake that is absolutely pristine. It really is a special place. If you’re looking for ideas on trips, you can visit thisiscooperstown.com, which is a wonderful website for visitors, and our website is baseballhall.org. That’s great. It’s terrific insider advice, Columbus Day weekend, so we’ll have to mark that one down on the calendar for sure. I really appreciate you spending some time with us today, Craig, and we’ll look forward to checking in with you again soon. Thanks, Nicole. It was a pleasure.